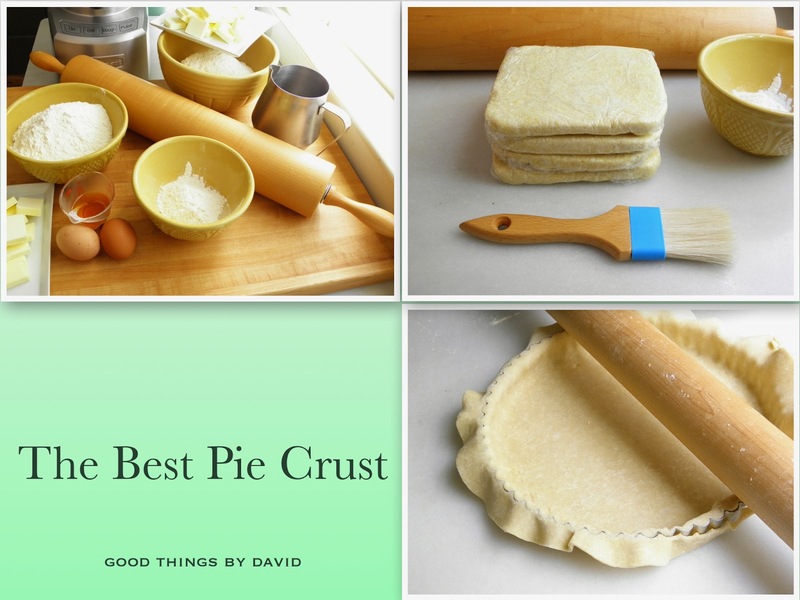 What is your idea of a good pie crust? Some say it is one which is so flaky and tender that it shatters into numerous shards of delicate pastry when you cut into it. Others may tell you that a good pie crust must have the unmistakable flavor of butter in order to be delicious. For me, a good tart or pie crust must possess all of these essential qualities in order to meet with my approval for baking. The good thing about pie crusts made from scratch is that they are not difficult in the least to prepare. There is no need to settle for store bought once you've mastered the basics of pie crusts. 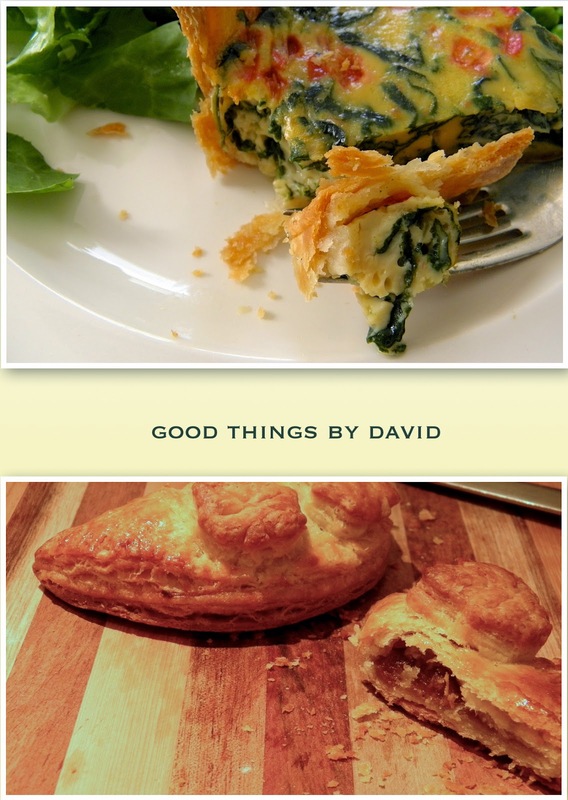 I've long been fascinated with pie crust recipes calling for the addition of vinegar, so in my quest to come up with my own recipe for Good Things by David, I searched as many as I could find, and I tested. After consulting with my pastry chef mother on her opinion regarding eggs in pie crusts, she said that at least one egg is essential for a basic pie crust. Mom goes on to say that if the crust is being used with a sweet filling, she would then enhance it further with a little bit of vanilla extract. This is entirely optional! What I did not want to add to this recipe was vegetable shortening (or lard), because I never stock it in my home. I realize many people enjoy the flakiness that lard or shortening can bring to a pie crust, but if you work with cold butter and make the pastry quickly in a food processor, your pies & tarts will be just as flaky. An all-butter pie crust is simply the best for any pie. The technique is simple and the results are delicious. Two 10" pie crusts, enough for 1 double crust pie or 2 single crust pies or tarts. Measure out your ingredients and chill them in the refrigerator until you are ready to make this recipe. Thoroughly chilling the flour, salt, sugar, egg, vinegar and butter will give you the results you desire in a perfect pie crust. I know many bakers who even chill the bowl & blade of the food processor (a good tip if your kitchen is warm). In the bowl of your food processor fitted with the metal blade, add the flour, salt & sugar. Pulse 2-3 times to combine them thoroughly. Add the cubed butter and scatter it evenly into the work bowl. I always cube my butter ahead of time and chill it completely before making pastry rather than adding whole sticks into the dry ingredients. Doing this will allow the butter to disperse into small bits quickly, without warming up the ingredients. Pulse the butter a few times (DO NOT let the machine run) until the butter begins to break up. At this point, you want your pastry to be coarse and seem sandy; you should still be able to see bits of butter. In a small bowl, whisk the egg and cider vinegar together and slowly drizzle it into the feed tube of the machine, pulsing as you go. This should take about 3-4 quick pulses. Have your ice cold water ready and slowly pour it into the feed tube, pulsing in short bursts as you go. Pay very close attention to what's going on in the food processor bowl. When you begin to notice the pastry changing texture and resembling wet sand, stop the machine and check. Grab a bit of pastry and squeeze it in the palm of your hand. Does it clump together and resemble this? If so, you're done. You may not need all of the water. When making pastry, a lot will depend on the conditions of your kitchen. If it's humid, the pastry may only need 4 tablespoons of water. A good pie dough will clump together when squeezed, but will still be crumbly. You do not want a sticky dough that feels tacky and wet. Quickly divide the dough in half among overlapping pieces of plastic wrap. Gather the ends of the wrap and draw them into the center, pushing down into the pastry. You want to form a disk rather than a ball of dough. This is what you want to end up with. Two perfectly formed pieces of pastry ready to get placed into the refrigerator before being rolled out. The dough can chill in the refrigerator for up to one day, but can be frozen for up to one month (place these wrapped pieces of pie crust into a larger zip top freezer bag for protection against freezer burn; thaw overnight in the refrigerator). Freshly made pie crust and all pastry must be chilled completely for at least one hour before being rolled out. As I said, this will make approximately 1 1/2 lbs. or 700 grams of pastry. I like to weigh each half to make sure my crusts are even. When you roll out this dough you'll notice that it doesn't tear. It's a good pie crust. When it bakes, the crust becomes golden and irresistibly tender. When you take a bite, it's exactly what you want to experience from a good pie crust. The photo of those mini hand pies was taken at the demonstration I did at Williams Sonoma. I must have handed out 6 dozen or more samples of this baked pie crust and every single individual that took a bite claimed it to be "the best pie crust". That recipe for the mini pumpkin hand pies is coming soon! I want every baker to try this recipe because it is one you will hopefully turn to again and again. Suitable for fruit pies, custard pies, hand pies, tarts & quiches, my pie crust will give you success in the kitchen and will make you a fan of homemade pie crusts. Never again will you turn to the refrigerated section of your supermarket & buy those packages of premade crusts or those frozen shells meant to be filled and baked. With a bit of preparation and planning, several crusts can be made quickly and easily at home, and get frozen until needed. Bake a pie soon and partake of delicious, flaky pastry made from my home to yours. Enjoy! Pie crust has always intimidated me but your recipe... well, your recipe is the one I will attempt; I promise! I've just picked up the heirloom and traditional pie crust cutters available at Williams-Sonoma so I guess I'm out of excuses! You're going to love those cutters and you know what? I bought them too!